My ‘Older Mom’ Mother by Sharon O’Donnell | MotherhoodLater.com - World’s leading website, eZine and community for midlife moms. Not only am I an older mom since I had a child when I was 38, which is considered advance maternal age; but, my mother is also an older mom because she had me when she was 38. I’ve written in my book, Please Don’t Let Me Be the Oldest Mom in the PTA, about our close relationship, particularly how my being the youngest child meant that we spent a lot of time doing things together as my siblings got older and did things with friends. Mama is now 94 years old. 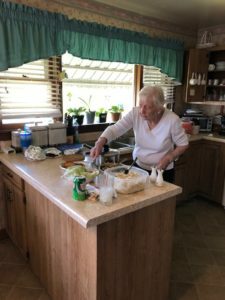 She suffers from macular degeneration, so her eyesight is poor, but I think she compensates somehow because she still cooks great meals and gets around pretty well. When me or one of my siblings takes her to the eye doctor though, suffice it to say that she has to squint to make out the top line. I really don’t know how she does it. She has been a wonderful mother, grandmother, sister, great-grandmother, friend to many, and of course, wife. My father is also 94, and he also is a gem. Worked in his own business from the 1950s until just this year when hip and leg pain has gotten too debilitating, and his memory has had some lapses. Of course, it’s been hard on him, but I know it’s also been hard on Mama because my father has been her companion through 70 years of marriage, and she’s always looked to him for support and assurance in life that things will be okay. Sometimes I think she’s in denial that his health is declining. My life-long friend, Tina, came to visit me last weekend from Florida. Tina and I grew up together, and our mothers were friends — actually our entire families were friends with each other. Tina’s beloved parents both passed away in the past three years. She keeps up with my parents and goes to visit them when she is town. 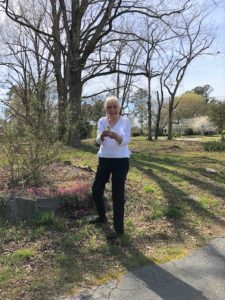 This past weekend, as she and I were in the car backing out of my parents’ driveway after a visit, Tina saw my mother walking outside and tending her flower garden. Tina pulled out her phone and started taking photos and videos to capture her doing this. I’ve posted one below as well as one of my mother in the kitchen making her famous chicken salad. Sometimes we get used to the everyday kind of stuff, and it takes someone visiting — someone special like Tina — an incredible friend — to look at something we see routinely and realize how amazing it is. That’s what she did when she saw my mother that afternoon. So here’s my mother, Wiloree. An older mom getting older. But still going strong.